Today I will like to talk about something you would never hear from a debt settlement company. One of those is giving you enough information to decide whether a settlement is right or wrong for you. The reason for that is mainly profit. It is mainly because if you don't engage with their services they are not getting paid, so there is an easier softer less information approach that is taking to sell people on the idea that selling is a good idea for them to avoid bankruptcy. 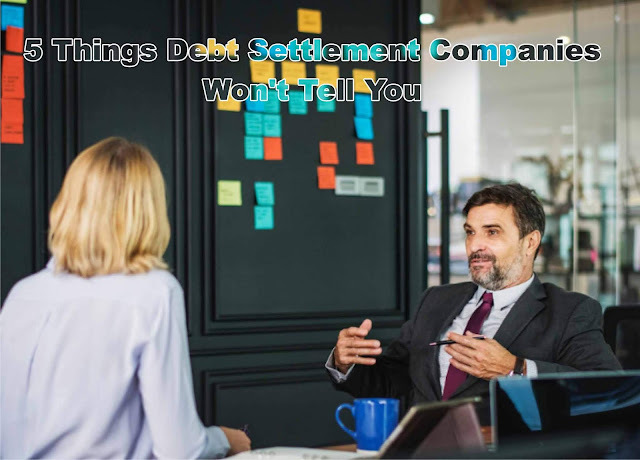 In this article, I want to talk about five things that you will not hear at that settlement company. That is self-explanatory because if many fees are high it prevents you from settling the second debt, the third debt and the fourth debt because most of the time debt settlement works like this. You save up money. As soon as you have enough to settle one account you settle it. The company grabs their fees. You save up money again. Start over another 6 or 7-month adding money to an account every month and as soon as there is enough settlement debt companies settle for that and collect their fees. Those fees actually prolong how it takes you to finish them so you are not going to hear them talk about that. You are going to hear them talk about how you can do this on your own. Or talk about how some creditors are not even going to work with them forcing account out to a third party to settle for higher rate all because of fees. This can happen so much faster because nobody will signup with them, they are not going to be able to stay in business so fees matter. Just because CRN's fee is the lowest in the industry historically it doesn't mean that there aren't good companies out there doing similar things. There are a couple, unfortunately, most companies charge either about 18 to 25% of your enrolled debt so if you have $50,000 worth of debt their fees are 20% of that. Obviously, that affects your ability to finish them or succeed with them. Or they charge a percentage of saving like CRN does, only those are 30 to 40 and sometimes even 50% of savings. Believe me fees matter in debt settlement. That is self-explanatory as well. You're a captive lead that is what the industry refers to you as when you are on the phone with a debt settlement sales person. So the last thing they want to do is recommend you connect with anybody else let alone an attorney where you might learn that bankruptcy is probably an option too because anybody that is looking at debt settlement is looking at it as an alternative to bankruptcy and I get it bankruptcy want to avoid it. It understandable but might be the right thing to do. Hearing from somebody that you should go and talk with somebody else about your situation and there might be a better answer that is consistent with you getting out of debt for the least amount of cost and the quickest way and consistent with your goals for yourself, fresh start example through chapter 7 bankruptcy, you are very rarely going to hear that. You need to research all your options, if you are ready to place where you can no longer afford your monthly bills it is a process of elimination and it involves checking up 3 intervention options. Find out what your qualifications are for chapter 7 and weigh those three things and then make a decision. Talk with reputable companies that have built a report, that you trust, that are going to share the details beyond these five things, but these five things are very important. The fact is some creditors won't deal directly with a settlement firm. What happens when creditors do this is you are required to let accounts go more delinquent than might have been necessary. So when a settlement company is not telling you that some creditors are not going to work with them, they actually can be impeding your ability to succeed or save the most with the settlement or settle earlier so that there is less of an impact to your credit report. It is a key thing to not share that information with you. 4. A Debt Settlement Company Will Not Tell You That They Have To Wait For Some Account To Charge Off Before Trying To Settle, Even Though This May Cost You More. What do I mean by that? If a debt settlement company tells you that they are going to have to wait longer, they may have been necessary to settle an account, what they are not telling you is because number one where some creditor is not going to work with them. It forces them to have to deal with the debt collector. Debt settlement is a very predictable process. It is why the entire industry exists and by predictable when it comes to number two your creditor charge off debts. They have to, it is actually part of the counting principle that they have to abide by. When they do that they do one of three things. They send it to an attorney and that attorney is going to collect part of that collection might even involve suing you to get you to pay. When a debt settlement company fails to tell you that some of their creditors your creditors are not going to work with them and they don't have to wait for a debt collector to get the account before they can actually settle it for you. They may cost you 10 to 15% more even higher and the settlement arrangement. It will cost you money. 5. You Can Settle Debts On Your Own And Sometimes, Get A Better Deal. I just talked about that as part of number two but I want to hit just a little bit harder so that you grasp what I am saying. You can get terms where you're saving up for 7 months for the settlement company that settles it in full you might be able to settle direct with one of your banks and get 90-day terms. You got $10,000 account, let's say you settle it for 3,000 and they only need a thousand in the first month, a thousand in the second month and a thousand in the third month. You are able to budget and save and settle the debt and save $7,000 and spend 90 days doing it. Whereas hiring a debt settlement company you might have missed that opportunity.